As part of a fundraiser for child abuse awareness, 360 DHS students broke the Guinness World Record for most people standing on one leg at the same time. 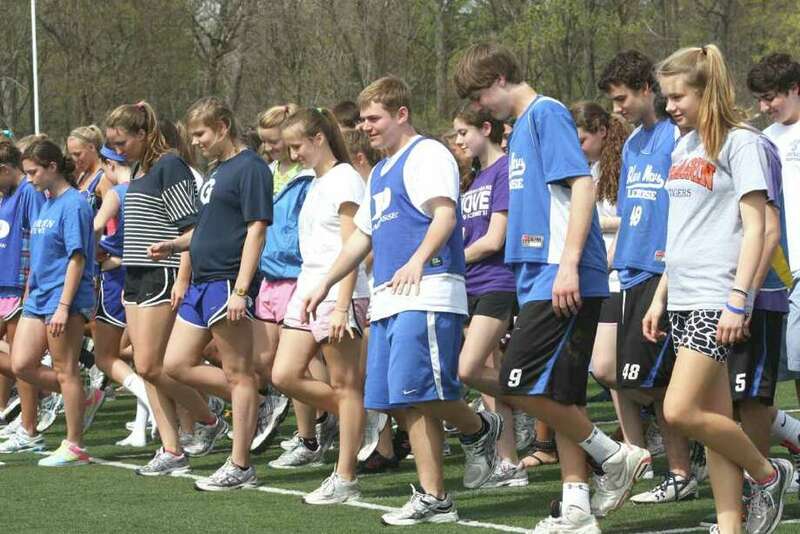 After two minutes and with the help of 360 people, Darien High School successfully set a new world record only months after the original record was set. In an effort to combine a fundraiser with a high-profile event to attract more participants, a group of sophomore class advisors decided attempting to break a world record would be ideal. The record they were looking to break was the most people standing on one leg at the same time. History teacher and advisor for the event Lynn Brown said the students were brainstorming ideas for what they could do to generate funds for child abuse. One of the class advisors, Patrick Durkin, happened to stumble across the idea while surfing the Internet. "We were trying to think of ways to do a fundraiser that would be easy and I happened to find this particular record," Durkin said. "We weren't serious about it at first but then we thought it would work." Before the attempt could even be made to break the record, Guinness had to be contacted to determine what needed to be done to make the attempt legitimate, Brown said. "Guinness sent us a long list of requirements and it took a while before we even heard back," she said. Some of those requirements included having photos and video and media coverage of the event. Brown said 25 percent of the proceeds from Wednesday's event would be donated to a child abuse organization. In order to break the record, everyone had to stand on one leg for two minutes. Once enough people were gathered to make an attempt to break the record, Brown laid out the ground rules for what would be cause for disqualification. Anybody who changed feet, touched another person or lost their balance would be removed from the line they were in after two failed attempts. Standing on one leg for two minutes proved to be less challenging for the participants as only two people were pulled and 360 successfully stood for the full two minutes. Sophomore Class Advisor Riley Sousa said there were times when tensions were high but was glad to see the number of people who participated. "It was really impressive that our school came together to make this happen," Sousa said. Durkin said the record couldn't have been broken without the support of the coaches who encouraged their teams to participate as well as community members who showed up on short notice to be notaries and witnesses. With a new record now on the books there was some concern that New Canaan may try to usurp the title from Darien. "The thought crossed my mind that New Canaan may try to beat us but we'll just do it again if they do," Sousa said. "A little competition is good." Sophomore Class Advisor Kylie Maier was definitive with her view of any attempt by New Canaan to set a new record. "If they beat us we'll make sure we end it," Maier said.